The fountain feeds the garden. The warden guards the false serpent. Abominations, the most devout of the followers of Zehir, are ranked the highest in yuan-ti society and are blessed with a near complete transformation into snake-like forms. 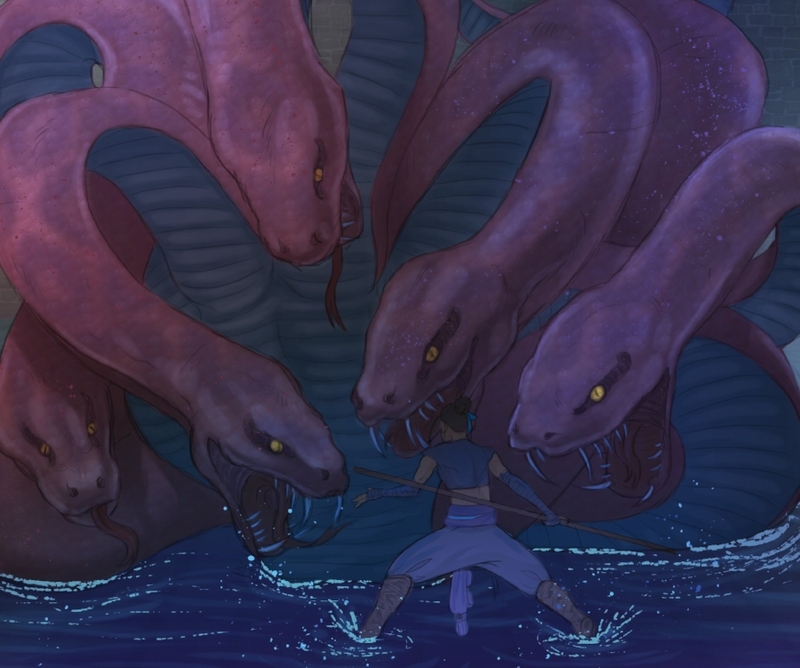 This particular abomination had been sealed beneath the temple, lost deep in worship and meditation while awaiting the moment the warden would need to be summoned to protect the path to Uk’otoa, the sealed “False Serpent.” Due to his monstrous appearance, the abomination’s initial presence served as a red herring to the Nein, leading them to believe that he was “the warden” of which the clues they had retrieved before spoke. The abomination wielded two weapons, a longbow and a scimitar. Though he missed on his slowed attack with his scimitar, he managed to land several solid strikes with the longbow, knocking Jester down to less than half health with one arrow and Yasha with two. During his first round, the abomination dragged his scimitar over the edge of the pool, summoning the true warden. Shortly thereafter, Fjord cast Hunger of Hadar, obscuring the abomination. Hidden under the cover of darkness, and with the Nein distracted by the hydra, the abomination found himself free from harassment for the majority of the rest of the encounter as he was able to support the hydra, though the damage he could deal soon paled in comparison. Thanks to @KGBooker for this art piece! Hydra are huge creatures that can move as easily on land as they can through the water. Traditionally fierce, they hunt with no concern for maintaing a consistent food supply in their environment, and will usually move on when their hunting grounds have been cleaned out. Campaign 1 viewers will remember back to episode 17 where Vox Machina battled a hydra in the forests outside Vasselheim, albeit at much higher levels and with the full element of surprise on their size. The yuan-ti have a definite aesthetic: snakes, snakes, and more snakes. Naturally, their most important guardian, the Warden of the False Serpent, would fit that theme in the form of a five-headed hydra. For this hydra to have stayed in one general place for this long, the yuan-ti must have cared for it, providing it with a consistent supply of fruit from the underground orchard. They also kept it hungry for intruders. With five heads ready to feed and more ready to feed with each of those dispatched, the Warden was truly a dangerous guardian of the people of a Betrayer God. The Mighty Nein, realizing quickly that getting in melee range would draw the ire of the hydra, primarily stayed out of range of its heads for the battle. Only Beau, Yasha, and Avantika dared to stay within melee range, with Beau and Avantika taking the brunt of the hydra’s attacks. Yasha ended up dealing 114 damage to the hydra. 34 points of that was thanks to Caduceus rendering the hydra vulnerable to all damage she dealt on two strikes. By staying in range with Patient Defense up, Beau kept the hydra’s attention for rounds 3-5 and off of her squishier friends. Because Beau took one for the team and tanked against the hydra, she ended up going unconscious. Nott, who had stayed hidden throughout the battle, was able to get sneak attack against the abomination and kill it just before it would have potentially put its scimitar into Beau’s unconscious body.